Daniel J. Murphy - dmurphy@shawmedia.com Second grade teacher Kieran Zastrow teaches a class inside the “Star Lab”, an inflated dome in which constellations can be projected on the ceiling Wednesday May 2, 2012 at Mackeben Elementary in Algonquin. This is the first time the lab has been used since being placed into storage six years ago following D-158 budget cuts. 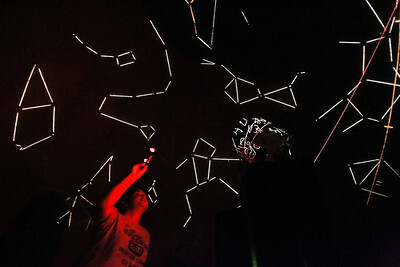 Second grade teacher Kieran Zastrow teaches a class inside the “Star Lab”, an inflated dome in which constellations can be projected on the ceiling Wednesday May 2, 2012 at Mackeben Elementary in Algonquin. This is the first time the lab has been used since being placed into storage six years ago following D-158 budget cuts.